Aubrey Huff mocked Joba Chamberlain’s trademark fist pump after taking him yard. 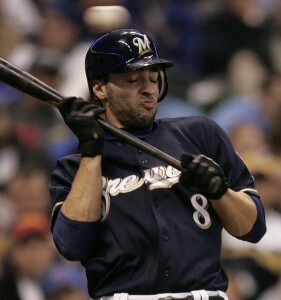 Ryan Braun glared at Ryan Dempster after hitting a home run off him, following a previous at-bat in the same game where he was clipped on the helmet by a high and inside fastball. Casey Blake mocking Giants closer Brian Wilson’s trademark gesture after hitting a home run off him. All of these incidents drew the ire of baseball traditionalists, in one way or another. In Braun’s case, I had MLB Network on (as is standard in my household), and Mitch Williams just about lost it. I’m pretty sure “You need to play the game the right way” was uttered ten times in one segment. In Mr. Williams’ estimation, what Braun did was a travesty, and a player should never show up the opposition, especially when he’s a younger guy. Heaven help us if the batter shows any emotion out there, particularly if the pitcher was aiming close to his head in the previous turn at-bat. Maybe Mitch Williams has terrifying Joe Carter flashbacks every night and doesn’t like the idea of a hitter celebrating, ever. But if a pitcher went at my head, and then I hit a home run off him, I’d probably glare too. How many of us glare at another driver, for example, when they do something irresponsible that puts our safety at risk? One of the best and worst things about baseball is that unlike basketball and football, a trip through the minor league system is practically mandatory for all players. Not due to any “code”, but because regardless of how talented you are, you’re going to need seasoning and experience to get ready for the big leagues. So you’ll be riding the buses, playing in smaller cities in front of even smaller crowds, improving your game and getting better while dreaming of playing at a venue that isn’t featuring “Scientology Night” or “Christmas Eve in July”. And generally, this is a good thing. It instills a sense of humility in baseball players that you don’t see as much in the other two aforementioned sports, where it’s entirely common for an athlete to get drafted, and go straight to the major league club (along with the rewards and fame that come with it). The bad part? This process can generally sap a player’s personality, showmanship, and otherwise entertaining characteristics. Now granted, it’s easy for me to sit here behind my keyboard and bash on “The Code”, and its unappealing nature. I’ve never been a big league player, don’t “understand” it, and I’m sure Mitch Williams and his ilk would be quick to point that out while reading this post. But here’s the thing they’d be missing: I pay their salaries. Ok, technically ownership pays the salaries, but it’s nerds like me who hide behind keyboards (ostensibly, in our parents’ basement) who buy tickets, get the MLB iPhone app, and buy jerseys to line the pockets of owners. And if we want to see a bit more from our players than drones with no personality, who is a code-abiding veteran to tell me otherwise? You can be respectful while still being emotional. You can show your personality, entertain the fans, and not “show up” the opposition. We like our athletes to be larger than life, but it doesn’t mean we expect them to be robots. So Mitch, I appreciate where you’re coming from, and that you want players to “Shut up, put your head down, and round the bases.” But at the same time, let’s not shackle their emotions for the sake of some militaristic code. This is baseball. It’s a kid’s game. We watch it to enjoy it, sometimes with intensity, and appreciate it when the players we cheer for do the same. Toby, I thought Aubrey Huff poking back at Joba was great. If Chamberlain is claiming he should get a pass for his histrionics because he is just an emotional guy, then he better learn to take it/ignore it when someone else tries to ruffle his emotional feathers.